By the summer of 1919, American officials expected the imminent repatriation of Russian POWs from Germany. The Allies supported the White Russian armies and had committed their military forces to occupying North Russia and Siberia. General Anton Ivanovich Denikin was preparing a major summer offensive to regain the Ukraine, and General Nicholas Yudenitch would launch an attack on Petrograd in the fall of 1919. While the Polish frontier and the Danube River-the natural routes of prisoner exchange-were closed to traffic, American relief organizations planned the repatriation process through Baltic ports. In May 1919, the American Red Cross sent commissions to Lithuania and Estonia to prepare for these operations. After shipping relief supplies and personnel to these countries, the Red Cross set up clearing stations to process Russian prisoners from Germany. Over twelve thousand Russians passed through Lithuania in May 1919, but the organization acknowledged that they were a "mere drop in the bucket." Red Cross officials worked with the Inter-Allied Commission to facilitate this Baltic exodus. An additional twenty-six thousand Russian POWs traveled through Estonia within the next few months. In addition, the Allies developed a Hamburg-to-Odessa shipping route to transport Russian prisoners to southern Russia. By the end of the summer, the Allies had transported fifty thousand prisoners on the long voyage to the Black Sea. 6 By May 1920, the American YMCA had greatly expanded the scope of its WPA work for Russian prisoners. Anderson and Somerville joined Lowrie in Germany to expand Association operations. This force was augmented by fifteen American Rhodes scholars from Oxford University who volunteered to spend their summer in Germany helping the Russians. The situation in the prison camps had changed radically during the winter months. The Russian POWs became zealous students after a rumor began that the Soviet government would not accept any POWs who could not read or write. Russian welfare committees in the prison camps "abolished illiteracy" among these soldiers, who were largely peasants, and declared that no prisoner would be repatriated who could not pass a literacy test. 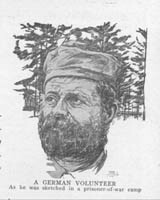 Anderson helped the Russians set up schools across Germany. The POWs set up education committees, recruited teachers from the POW ranks, and the Association obtained scarce Russian textbooks from a variety of sources. 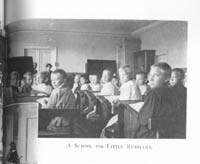 The dearth of textbooks was the primary obstacle, and the YMCA had to import them from the Russian border countries, such as Latvia, Poland, and Czechoslovakia. Anderson also requested that the Russian Department of the American YMCA publish Russian books in Berlin. To teach orthography, the Association printed the letters of the Russian alphabet on large sheets of paper. Teachers could easily tack these sheets to the walls of classrooms and POWs could practice copying the letters in their notebooks. 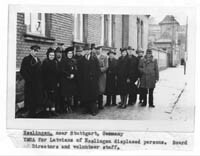 15 The YMCA secretaries dispatched to work with Russian prisoners also cooperated with other American relief organizations working in Germany. American Red Triangle workers noted the terrible economic conditions the German people faced during the summer of 1920. The lack of fuel, the high cost of foreign raw materials, and difficulties in finding overseas markets crippled Germany's export industries, which represented 25 percent of the nation's Gross Natioanl Product before the war. Every German city was crowded with idle men, barefoot women, and sickly and stunted children. The cinemas were crowded every night, not because of widespread prosperity, but because the movies were the only place people could get warm. The German government was headed for bankruptcy, as state printing presses produced one billion new paper Marks each week without increasing the nation's gold reserves. The Germans were using up their permanent wealth at a rapid pace. They lived in houses they could not rebuild, wore out furniture and clothing they could not replace, and traveled over roads and railroads that were steadily deteriorating. In Stettin, the tramway system simply stopped because the company could not maintain fares that people could afford and simultaneously pay the wages of the system's employees. As a result, workers had to walk to their jobs, tramway operators became unemployed, and the company's shares lost all value. 17 The American YMCA consulted with the American Friends Service Committee (AFSC) and the American Relief Administration (ARA) during these organizations' welfare work in Germany. The first American Quaker delegation (consisting of Jane Addams, Carolena M. Wood, and Dr. Alice Hamilton) crossed the Dutch border into Germany in June 1919 and conducted a survey of conditions. They reported on the terrible impact of the Allied blockade on the health of German children, and they recommended that the AFSC undertake a food distribution program to assist them. German children suffered from a variety of diseases including rickets, mental retardation, dropsy, anemia, skin disease, and especially tuberculosis. Children were often two to three years older than they appeared. During the fall of 1919, Herbert Hoover asked the Quakers to take over American food distribution in Germany. 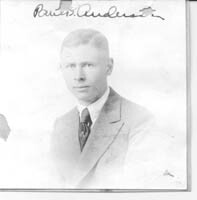 The AFSC accepted the request and sent the first group of eighteen relief workers, under the direction of Alfred G. Scattergood, in January 1920, to initiate food distribution operations. Within six months, the AFSC was feeding approximately eight hundred thousand undernourished children one hot meal a day. 18 The Quakers set up food distribution operations across Germany, focusing on large cities, particularly Berlin, Danzig, Stettin, Breslau, Frankfurt-an-der-Oder, Hamburg, Essen, Cologne, Coblenz, Frankfurt-am-Main, Mainz, Munich, Leipzig, Dresden, and Chemnitz. The organization set up eight relief districts, with a central office in each district (Essen, Cologne, Hamburg, Berlin, Leipzig, Frankfurt-am-Main, Dresden, and Munich). Two or more American Quaker representatives were assigned to each office-with the exception of Cologne, which was under the direction of the British Society of Friends-to coordinate and inspect the allocation, transport, and distribution of supplies; to arrange medical examinations of mothers and children seeking rations; to organize and direct local volunteer groups; to make periodic reports, inventories, and audits; and to enable efficient, honest, non-partisan, and friendly implementation of this program. The AFSC was able to set up such an extensive operation by enlisting German volunteers; over twenty-two thousand Germans supported this great humanitarian enterprise. The Quakers organized central kitchens and feeding stations in these cities, providing the food and equipment. Children received white bread and thick, hot soup after they had been selected through a careful medical examination as the neediest cases. 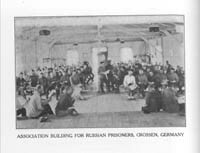 41 The American YMCA's service to Russian prisoners in Germany after June 1919 reflected a major change in the International Committee's policy. 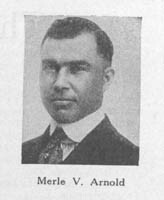 While Red Triangle secretaries provided some support to ARA and American Quaker relief operations for the German population, the Association did not concentrate on German social welfare work. 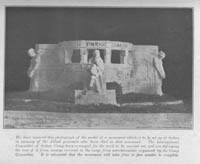 To some degree, this arrangement reflected the strained relations between the American and German YMCAs, but it also reflected the decline in the American Association's resources after the war. The end of the conflict, combined with a post-war recession in the United States, resulted in a serious downward turn in financial contributions to the Association. In addition, the International Committee had numerous goals during the war, and the scarce resources it had were dedicated to fulfilling these obligations. The American YMCA could not take on new projects with a declining financial base. 42 The American YMCA did continue to support prisoners of war trapped in Germany after the war. 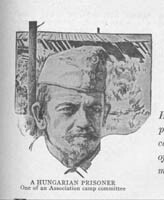 The Association recognized that Russian POWs faced the prospect of remaining in German prisons, while the other Allied prisoners returned home. Russian POWs confronted the further threat of having to choose between Bolshevism and their traditional beliefs. With the collapse of the White Russian armies and the Allied withdrawal from Russia, the YMCA concluded that they could not defeat the Bolsheviks, but sought instead to establish a modus vivendi so that the Association could establish welfare operations in the country after the end of the civil war. 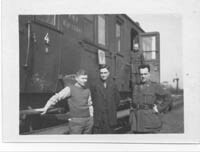 WPA work for the Russian prisoners was transferred to the Russian Division of the American YMCA and renewed with great vigor in Germany. When the United States entered World War I, Mott seized the opportunity to expand Association operations in Russia in alliance with the Orthodox Church. As this optimism collapsed with the advances of the Red Army and the Bolshevik institution of the Red Terror, the Association had to revise its objectives. The Soviet attack on the church eliminated any opportunities for the YMCA to work with the Orthodox Church in Russia; instead, the Association worked to save and bolster the church during a period of crisis. With the influx of Red Army prisoners into Germany after the Polish victory, Red Triangle workers strove to assist all Russians trapped-for whatever reason-in Central Europe. 43 The resumption of Baltic trade and the peace treaty between Russia and Poland opened prison gates in Germany. 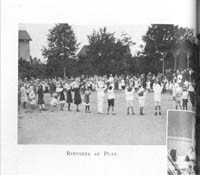 By the fall of 1920, the majority of Russian POWs in Germany had returned home, and the YMCA redirected its resources to aiding Russian refugees. Several more years and the efforts of the Nansen Commission and the League of Nations were required to transport the last German and former Austro-Hungarian POWs home from Siberia. 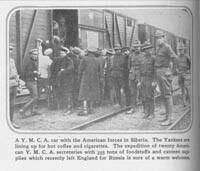 The American YMCA participated with other welfare organizations to help these poor unfortunates through their long ordeal as they traversed the Pacific Ocean for Hamburg or Trieste. But their experience was part of the aftermath of the Russian Civil War, and constitutes another chapter in the history of the American YMCA.